I started out in Nice and then biked the entire western coast of Corsica. Then, I took the ferry to Sardinia and biked there for 2 days. 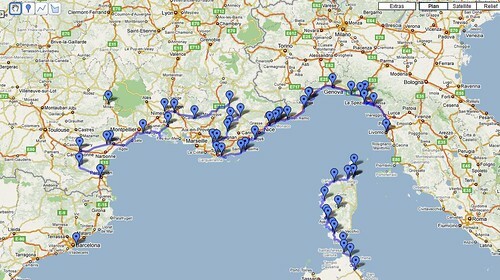 Next it was on to Livorno in northern Italy. I stuck to the coast of Italy, and crossed the border into France. After staying on the coast for a couple days, I went inland to see the Gorges du Verdon. I worked my way back to the coast, stopping in Dignes les Bains to see the Tour. I am now in Perpignan, and headed south to Barcelona. After that, who knows?! « The hottest day yet!